What about the electrics on my new vehicle, does Hayman Reese have the correct wiring solution for my particular vehicle? When should a mini hitch be used? Can I invalidate my vehicle warranty if I fit a Hayman Reese towbar? What happens if I have a problem with my towing system when on holiday or away from home on a trip? How do I know that the towbar I have purchased is a Hayman Reese? What does ATM, GTM, Tare Mass, Ball Weight and Payload mean? Q. What about the electrics on my new vehicle, does Hayman Reese have the correct wiring solution for my particular vehicle? A Every new release Hayman Reese towbar now comes with Smartclick™ intelligent wiring solutions. Each vehicle’s individual wiring system is analysed and dedicated connectors with ECU wiring boxes (where required) are custom developed to fully integrate into the vehicle’s existing wiring looms. This solution will offer the peace of mind, reliability and permanence that only dedicated connections can offer. Q. What is the correct towbar to fit to my vehicle? A The towbar must have a capacity that exceeds the loaded weight of the trailer you are intending to tow. Therefore you must check the rating of the towbar and the vehicle’s rated towing capacity which is included in the towing section of the cars handbook. There are three types of towbar available. For light duty towing, generally up to 1250 Kg, ‘standard’ towbars with a bolt on tongue are used. For medium duty towing the RL receiver with a 40mm x 40mm hitch receiver with a removable towball mount is ideal. For heavy duty towing a Heavy Duty hitch receiver is used this has a 50mm x 50mm hitch receiver designed for a removable ball mount or the Hayman Reese Weight Distributing Hitch. Q. How can I determine the rating or capacity of my vehicle? A If your vehicle has a tow rating this can be found in the handbook under the towing section. The vehicle tow rating will include a trailer weight capacity and a trailer ball weight capacity.All Hayman Reese towbars have a compliance plate which states the maximum tow rating and the towbar ball weight capacity. You should check the handbook to check the details for your particular model. Q. How can I check my ball weight? A Ball weight refers to the weight on the front end of the trailer not carried over the axles. As a rule you should aim to have 10 percent of the total trailer weight as ball weight. This can be measured at a weigh bridge by resting the jockey wheel only on the scale.Alternatively Auto Extra have a Ball Weight scale with which you can measure your ball weight by placing it under the coupling and winding the weight off the jockey wheel. Q. When do I need a Weight Distributing Hitch? A If your trailer’s ball weight is causing the back end of the vehicle to sag, a weight distributing hitch can be used to return the vehicle to its normal height and ensure you have full traction for braking and steering control.The weight distributing hitch is designed to ensure a return to even distribution of weight across all wheels of the tow vehicle and trailer. This even distribution ensures that positive steering and braking control is maintained. Q. When should a mini hitch be used? A A mini hitch is appropriate for light towing purposes only. It can redistribute ball weights up to 82Kg. 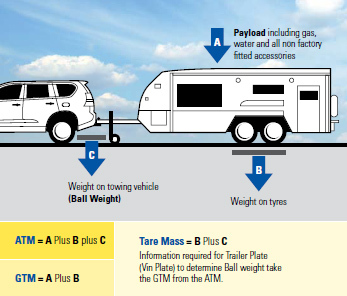 Therefore you should check the ball weight of the trailer or caravan to ensure it is within the mini hitch capacity. The mini hitch fits easily onto the towbar tongue and the spring bars can be adjusted quickly by selecting the appropriate chain link to bring the trailer back to a level height. Q. Can I invalidate my vehicle warranty if I fit a Hayman Reese towbar? A Fitting a Hayman Reese towbar will not cause you to void your vehicle warranty. Just remember that you have to stay within the vehicles recommended towing capacity. If there is a problem that arises as a result of the towbar being faulty and you have stayed within the recommended towing capacity you will be fully covered by the Hayman Reese Lifetime Warranty for as long as you own the vehicle. Q. What towball should I use? A The Australian Standard AS4177-2 recommends that 50mm towballs with a rating of 3500 Kg be used for towing trailers up to 3.5 tonne. The capacity should be stamped on the ball plus the manufacturer’s identification and a ’50’ to indicate the towball diameter in millimetres. Q. How can I stop sway from occurring? A Generally correct weight distribution will contribute to controlling sway because all wheels have full traction on the road. However sway can still occur from passing trucks, cross winds etc. If a weight distributing hitch has been fitted and you want to ensure sway is minimised a Hayman Reese sway control unit is highly recommended.A Friction Sway control can be used for ball weights from zero Kg upwards. A Dual Cam Sway control can be used for ball weights from 160 Kg upwards. You should check with Auto Extra to determine the appropriate unit to suit your needs. Q. Do I need a transmission cooler? A Towing increases the workload on a vehicle’s engine. This can cause the engine transmission to become hotter than under normal driving conditions. You should therefore refer to the vehicles handbook or your dealer for instructions covering the fitment of additional cooling equipment if necessary. Q. When should a brake control unit be fitted? A All trailers with an aggregate trailer mass (including the load) over 750 kg must be fitted with brakes to comply with national road regulations. Any trailer with electric brakes needs a brake controller to activate the operation of the brakes. The brake controller sets the timing and level of power output to the trailer brakes when activated by pressing the brake pedal in the vehicle. Q. What are the regulations relating to towing in different States of Australia? A A set of national towing regulations are now in place governing towing in Australia for trailers up to 3500 Kg aggregate of loaded trailer mass. In short the loaded trailer must not exceed the recommended towing capacity of the vehicle. Q. Do I need to alter the suspension in my vehicle for towing? A A trailer has ball weight on the coupling which when connected to the vehicle is held by the suspension over the back axle. This load is redistributed to all wheels of the vehicle and trailer using a weight distributing hitch to return the vehicle to its normal height.If a load is being permanently carried in the back of the vehicle (eg if gas has been fitted) then it may be appropriate to replace the standard springs with higher rated (carrying capacity) springs. These will not transfer any load away from the axle but will provide better support for the higher load being carried. It is preferable to transfer the ball weight when towing to ensure that the vehicle’s rear axle is not overloaded and to ensure maximum traction of all wheels on the road for optimum braking and steering control. Q. How can I make it easier to hook up the chains on my weight distributing hitch? A The hook up process is lifting and transferring the ball weight. As this can in many cases be a large weight we recommend that you use the jockey wheel to assist in lifting the weight. Therefore always wind down the jockey wheel so that the coupling of the trailer is lifted up before you put the springbars in place and connect the chains. You may also have to hook up a progressively higher chain link to get to the desired link rather than doing it in one step. Q. What happens if I have a problem with my towing system when on holiday or away from home on a trip? A Hayman Reese has a lifetime warranty covering its towing equipment for as long as you own the vehicle or weight distribution system. If you need assistance Hayman Reese have a freecall number 1800 812 017 to call. There are 150 distributors throughout Australia who can assist with solving your problem quickly and efficiently. So wherever you are in Australia Hayman Reese is with you. Q. How do I know that the towbar I have purchased is a Hayman Reese? A Hayman Reese have a compliance plate on all their towbars with their name, the part number and vehicle description. This is usually found on the towbar cross member. A sticker with the Hayman Reese logo is also placed in a visible position on the towbar for identification.If you have a hitch receiver towbar it can be readily identified by the aluminium collar which is fastened around the square receiver section. Q. Do I have to leave the trailer ball mount in the hitch receiver when I am not towing. A The trailer ball mount can be left in the hitch receiver as long as it does not obscure the licence plate. To prevent theft Hayman Reese have a Hitch Pin Lock available which replaces the standard pin and clip. Alternatively you can remove the trailer ball mount and store it in a secure place and use a Hayman Reese hitch box cover to provide a neat finish on the towbar and at the same time stop dirt and water readily getting into the hitch receiver. Q. What does ATM, GTM, Tare Mass, Ball Weight and Payload mean? The total permissible mass which includes whatever you add as payload (eg. water, gas, luggage) that can be supported by the wheels of a trailer. The GTM is specified by the trailer manufacturer and must not be exceeded. Tare Mass – The unladen mass of the trailer. The downward weight imposed on the rear of the tow vehicle’s towball from the coupling of a trailer. Payload is specified by the manufacturer. It must not be exceeded under any circumstances. Safety, insurance and warranty may be affected if the specified payload is exceeded. Please note that for the purposes of this product guide when we refer to trailer we are referring to any towable product. For example caravans, boats and trailers.